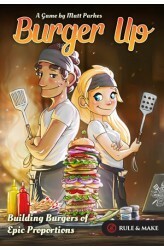 Burger Up is a card matching puzzle game about the art of burger making. Fill orders, earn prestige and be the best burger chef around! Players strive to become the most prestigious restaurant by building the biggest Burgers and by using the best ingredients. Players take turns, which consist of four phases: the Market phase where players may purchase ingredients from the market, the Building phase where players place up to 3 ingredients on their burgers, the Burger Up! phase where players may score their burgers if they satisfy an order and the clean-up phase where players draw back up to 4 cards. The game ends when no more Order cards can be revealed. 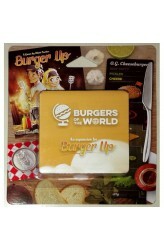 A bonus is awarded to the Chef who built the most burgers and then the winner is determined, based on who has earned t..
Burgers of the World expands the Burger Up game with 6 new Top Bun and 24 new Ingredient cards from 5 different countries: Australia, France, Germany, Japan, and Mexico. It also includes the customisable Globetrotter set, giving you a way to make your very own masterpiece. The Kickstarter edition of Burger Up includes this expansion. It can be purchased by itself at various online game stores and elsewhere ..